“Happy New Year Rose”, I say when I see Rose Nestler walk down the hallway to The Project Room at BRIC House in downtown Brooklyn. 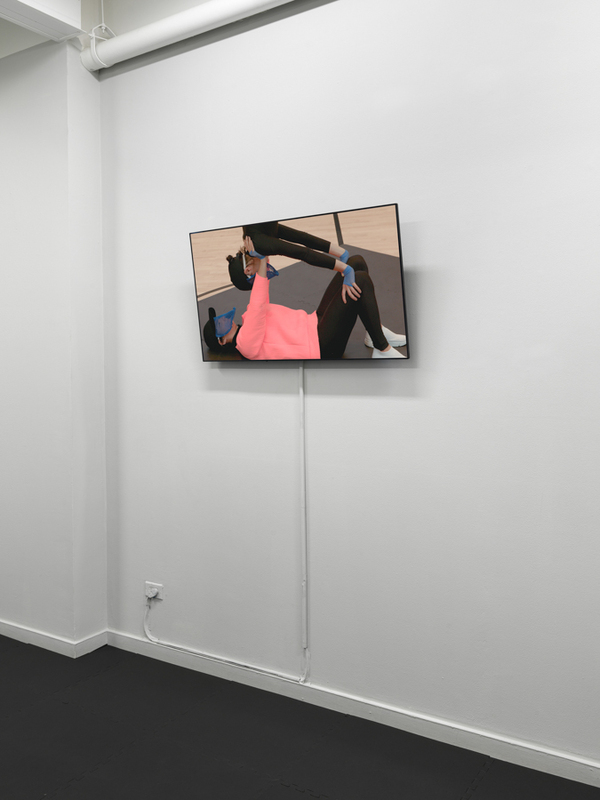 Gymnasia, Nestler’s solo exhibition, awaits inside and as we shed our winter layers onto a bench, I become audiotorally aware of scuffling sneakers, rhythmic clapping, and Gregorian chanting. We enter the room and as I begin to absorb the various components of the installation Nestler describes where the concept for the show originated. “I’ve be thinking about the idea of ‘winning’”, she says as I step onto the black rubberized MMA flooring in order to inspect a pair of sizeable black and neon amphorae. Noticing which work was the first to grab my attention, Nestler continues, “Essentially those are the ancient Greek vessels which inform modern day trophies. I want to highlight the concept of victory and reveal how fleeting and generally impossible it is”. 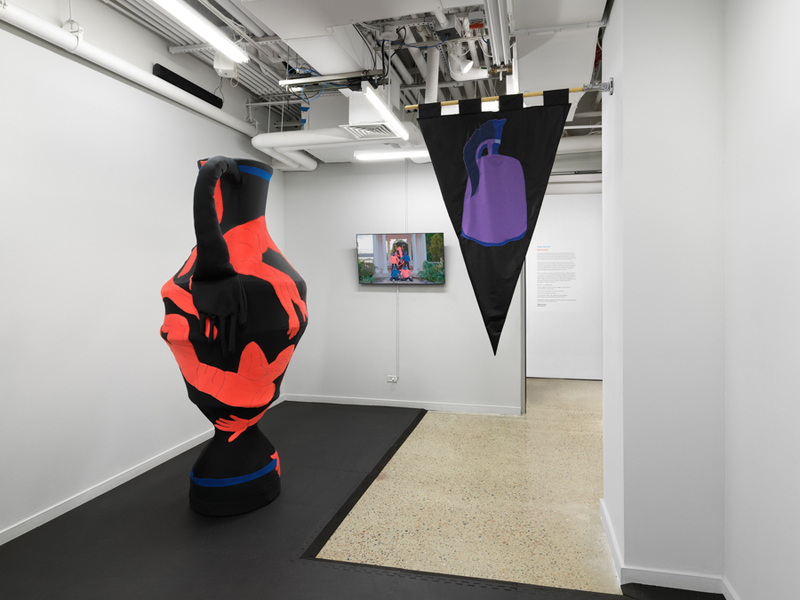 Nestler’s amphorae sculptures contain a host of formal and conceptual contradictions as images of triumph, ego, and masculinity are reimagined in soft jersey fabrics. Stylized bodies of coral, safety yellow, and sweatpants—gray serge-stitched against a black background— tumble and twist across the surfaces of these sculptures enticing the viewer to experience them from all sides. These soft sculptures dominate the room and anthropomorphize into a pair of vigilant coaches or gym class teachers due to the floppy cartoonesque hands which flare out from below the handles. This humorous transformation is the key for interpreting Nestler’s peculiar flavor of satire which regularly inserts subversive elements into arenas of power. Along the walls a curious display of choreographed athleticism plays out across the three monitors collectively imbuing the space with sound and motion. These videos serve as glimpses into a world where wrestlers perpetually grapple, acrobats perform routines across austere gym floors, and processions visored dancers step, clap, and glide through neoclassical gardens. I asked how she arrived at making the videos, while contemplating the formal diversity of the work. “I’ve always felt compelled to make three-dimensional objects, but felt slightly disappointed that they weren’t able to do more”, Nestler admits, “bringing video into my work was monumental”. 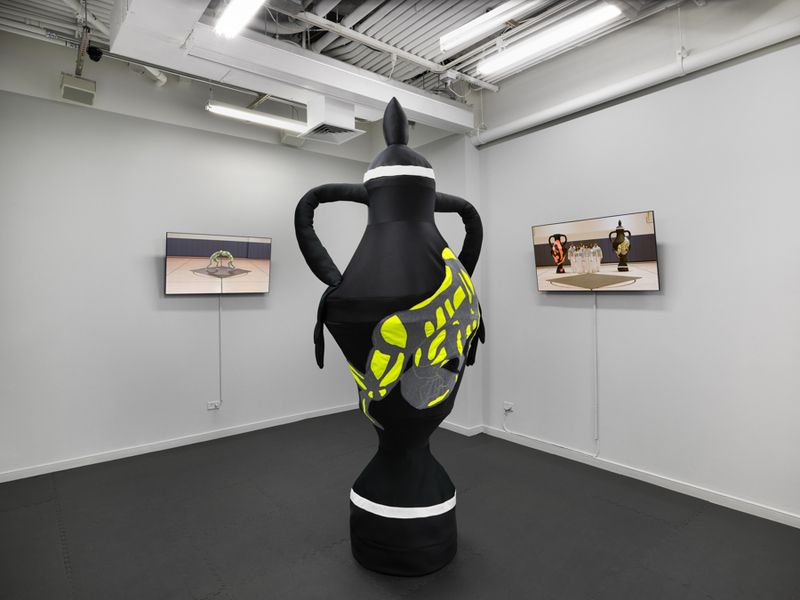 Nestler’s gigantic amphorae appear in the videos integrated amongst the movement of dancers costumed in corresponding hues of the jersey stretch fabric. In the context of the videos the sculptures transform once again into omnipresent reminders of idealized success infused with caricature-esque absurdity. Garment construction, choreographing, video and sound editing, the true breadth of Nestler’s practice is visible in this collection of videos as she constructs a fully realized Gymnasia universe. After closely examining the sum of its parts, Gymnasia, in all of its surreal idiosyncrasies is at its core a critique on institutionalized ideas of success within a culture that demands results. By recasting historical allegories Nestler utilizes the aesthetics of sports and athleticism to investigate notions of perfection, unpack power dynamics, and break down gendered misconceptions. For Nestler, reinterpreting the world of professional sports means deciphering the nuanced dogma of a public forum wherein individual athletes are both the ideals and lightning rods for political tension. Through Gymnasia, Nestler creates a realm where hard is soft, finesse is powerful, and humor is the great equalizer. Looking towards the future Nestler will continue to expand upon this body of work with her multidisciplinary approach and her toolkit of fabric and satire. To find out more about Rose and her work, check out her website.